Ah, the fence. Like I said earlier, a fence was a must-have because we have two nuggets who deserve to have room to roam in a grassy backyard. Our first home was, initially, fence-less. Building a fence became our top priority. We are bargain shoppers to the core, and the fence was no exception. We visit Lowe's on a regular basis just looking for major deals, and one day we walked over the lumber area. They were having a mega-sale on fence boards! Not just regular fence boards, but beautiful, high quality, smells-awesome-when-it-rains CEDAR boards! The sale was so good that the cedar boards were the same price as every other type of wood, even the cheapest of the cheap. Needless to say, we bought ourselves some cedar boards! And apparently so did everyone else in Dallas/Fort Worth because we had to wait almost a month for the shipment of cedar to come in. It was worth it, though! 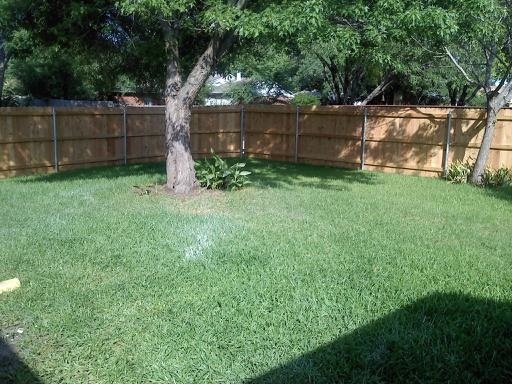 I have to commend my husband because even though he has had some sporadic help from a friend and my dad, this fence has been almost completely his project. From digging the post holes to laying the cement to measuring out the nice rounded corners, he handled it. He got some done before football season started, but once the team started practicing he had to greatly cut back on his time spent on the fence. For the last couple of months he has been able to work on it most Saturday afternoons for about three hours. Needless to say, progress has been slow. He is so sick of the fence he can hardly stand it... and yet, he is so proud of it. I'm proud of his handiwork- and the thousands of dollars we saved by doing it ourselves! 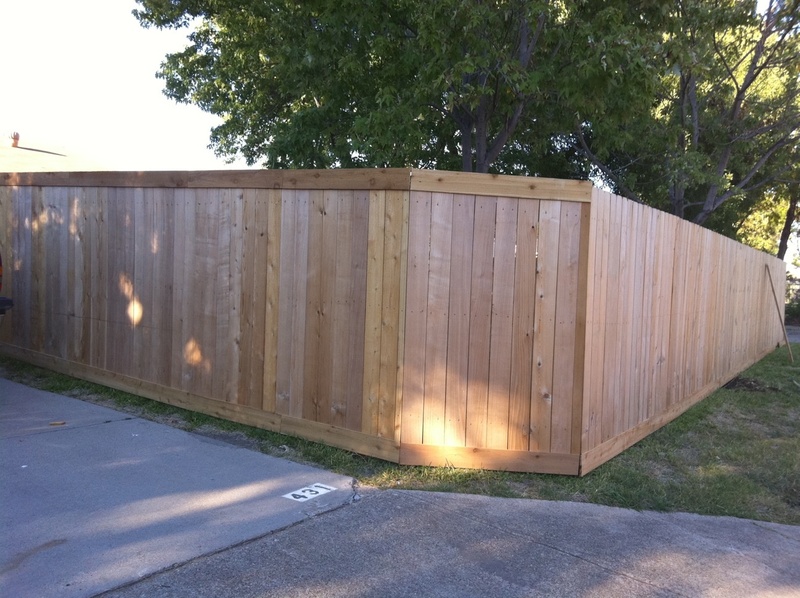 Beautiful cedar fence! Didn't he do so well?! The fence goes all around the backyard and halfway up our side yard. (he would want everyone to know that those were his idea). He has trimmed some sides of the fence but still has a couple to go. I must say, it is totally worth the extra effort. The trim is my favorite part! finish off the other sides and finally put this project to bed. Next Up: Master Bathroom Overhaul!